A recent report form the Texas Teaching Commission addressing policy gaps within key areas of the teacher pipeline in Texas provided recommendations on how to improve and align program and practices currently in place. One recommendation on the commission was to revise the current (adopted in 1997) standards for teaching practice. Once revised, these standards could support the agency in addressing additional recommendations, including the development of quality standards for teacher preparation programs and redesign of the beginning teacher induction and mentoring system. The Texas Education Agency convened two groups of practitioners to provide input on revising commissioner’s rules related to teacher and principal evaluation. Teachers, principals, education service center staff, and LEA staffs made up the committees. Each group provided insights and ideas for how to align the revised rules to the Texas Teacher Evaluation and Support System (T-TESS) and the Texas Principal Evaluation and Support System (T-PESS), both of which are being piloted for a second year in 2015-2016. TEA, Education Service Center, and TXCC staffs met to discuss and develop fall surveys designed to collect information from appraisers and teachers participating in the refinement year on their experience with the teacher evaluation system. The team also discussed the development of a yearlong communication plan for LEAs, which would highlight the key points in time during which LEAs could provide feedback on T-TESS to help the state improve the system before full-scale implementation in 2016-2017. In thinking deeply about continuous improvement guided by the collection of formative feedback from refinement districts, TEA leadership determined the need to include two additional components to its 2015–2016 approach to evaluating the Texas Teacher Evaluation and Support System (T-TESS) implementation. As a result, teacher rating analyses and case studies on districts experiencing success will be included in the evaluation plan. Additionally, TXCC will collaborate with TEA and the Region 13 Education Service Center regarding trainer quality agreements and selection processes. The TXCC also will support TEA’s in revising Commissioner rules concerning educator appraisal (Chapter 150) in order to align existing rule to the new systems. A draft of the Texas Teacher Evaluation and Support System (T–TESS) implementation guide was completed and sent to TEA staff for review and feedback. The purpose of the guide is to help local education agencies implement aspects of the new teacher evaluation system. This resource includes guidance, requirements, and lessons learned from Year 1 pilot districts. A final version is expected sometime this summer. Additionally, to help the state gather continual feedback on the system’s implementation, TXCC developed a brief survey designed to collect information from summer 2015 T–TESS appraiser training participants on the quality and usefulness of the sessions. The Texas Education Agency opened its Texas Teacher Evaluation and Support System (T–TESS) spring administration feedback survey in May. The survey is designed to collect qualitative and quantitative responses from LEAs and teachers on how they continue to use and understand T-TESS and its tools and resources. Over 1,200 teachers have responded with more expected before the survey window closes. The guidebook designed to provide implementation-related information to refinement LEAs is nearing completion. Feedback will be solicited from Year 1 T-TESS participants on its usefulness in helping individuals new to the process to understand the new teacher evaluation system. Changes will be made to the guidebook based on the input collected from these LEAs. In April, the National Institute for Excellence in Teaching continued to deliver T–TESS ESC train-the-trainer sessions around the state. The statewide launch will be completed in May. In addition, to help educator preparation programs (EPP) understand the new teacher evaluation system and its components, the state held a one-day meeting where EPPs were invited to hear about the system, its requirements, and ways that EPPs can support teacher growth and development. As planned, an initial draft of the T–TESS guidebook was completed in April. The guide is designed to support the LEAs’ implementation of T–TESS during the refinement year. TEA, ESCs, and Year 1 pilot LEAs are providing content for the guidebook, which will recommend implementation practices based on district experience implementing T-TESS. Plans for the development of an online T–TESS guidebook are on schedule with an initial draft expected next month. LEAs successfully implementing T-TESS are being asked to provide insights and share lessons learned with Year 2 pilot districts, which are joining the project during the 2015–2016 refinement year. The state continued its website, portal, and overall T–TESS communication planning in preparation for the onboarding of new LEAs during the refinement year beginning this summer. TEA is collaborating with the National Institute for Excellence in Teaching, Region 13 ESC, and TXCC staffs to think through the technological aspects of tools and resources integration. Additionally, in a strategic step to assist new pilot districts in Year 2 of the teacher evaluation system, the state is developing a guidebook for educators that will provide insights and supports gleaned from the experiences of Year 1 pilot districts. The purpose of the guidebook is to help LEAs understand where challenges might exist in implementation and suggest solutions based on the experiences of their peers. January marked the kick-off of a series of the Texas Teacher Evaluation and Support System (T–TESS) train-the-trainer sessions in San Angelo. Throughout the next four months, 18 more such trainings will take place around the state. The purpose of the sessions is to begin preparing a cadre of education service center staff who will become technical assistance providers for new refinement-year districts and existing pilot participants. The cadres will lead their own campus and districtwide trainings on T-TESS beginning this summer. During the month, TEA also received a letter from the U. S. Department of Education indicating that the State of Texas must provide additional details of its plans to implement teacher and principal evaluation and support system guidelines in order to renew its ESEA flexibility request. The renewal request submission is due by March 31, 2015. Region 13 Education Service Center (ESC), which serves as the T-TESS hub for technical assistance and support, convened all of Texas’ 20 ESCs in December to continue early implementation discussions. Conversations focused on the current support provided to participating districts such as the Teach for Texas portal, teacher and appraiser pre- and post-conferences, and the teacher goal-setting process. Attendees requested additional information on what constitutes “proficient” teacher instruction. District staff who previously worked with similar systems guided attendees through best practices and justifications for coherence across the various parts of T-TESS. The Agency closed its survey administration designed to collect qualitative feedback on how early implementation of the State’s revised teacher evaluation system was working. With 75% of participating appraisers providing feedback via the survey, the State hopes to be in close touch with the needs of early adopters. The Education Service Centers (ESCs) also continued supporting districts with this work by holding a third webinar. The purpose of the webinar was to support the needs of pilot districts by connecting ESCs’ contacts on the project with the practical experiences of other LEAs that have implemented similar teacher evaluation systems and procedures. TEA, TXCC, and the State’s multiple educator evaluation partners met to discuss technical assistance needs and plans for scaling the T-TESS. Although plans to pilot the student learning objectives component of the support system were delayed until Fall 2015, the State has continued to implement the balance of the system. TEA opened a survey this month to collect qualitative and quantitative feedback on T-TESS pilot participants in an effort to understand how LEAs and teachers are using the system and its tools and resources. One week into the survey’s administration, close to 20% of teacher appraisers had responded. An increase in the number of respondents completing the survey is expected. August was a significant month for Texas’ Educator Evaluation and Support Systems’ work. As part of a thoughtful approach to scaling the State’s new evaluation system, TEA in collaboration with TNTP, held the first Student Learning Objectives (SLO) advisory committee meeting. This group, comprised of teachers, principals, education service center staff, and association staff, convened to discuss the purpose of SLOs, including their essential components, review various models in use across the country, and develop a set of guiding principles for a Texas SLO model. Additionally, a call for participation was also released, asking LEAs to consider piloting SLOs in winter 2015. The experiences of participating districts and campuses will help inform the State’s plans to implement all aspects of the T-TESS in 2015–16. Two other successes include the (1) completion of a district feedback tool designed to help the Agency understand how districts and teachers are implementing the new teacher evaluation rubric, and (2) kick-off of the first of seven planned videoconferences. During the videoconferences, pilot district staff and teachers will be asked to describe their perceptions regarding the quality of the training they received on the observation rubric; knowledge of teacher skills and competencies, and capacity to implement each rubric domain and its corresponding dimensions; and usage of T-TESS technical assistance tools. The Texas Education Agency (TEA) successfully completed its goal to train pilot districts on Texas’ Teacher Evaluation and Support System (T-TESS). Throughout the pilot period, TEA, in collaboration with education service centers and TXCC, collected information on the system’s implementation so refinements can be made that reflect practitioner experiences and best practices. The planning process for a year-long communication structure and feedback collection strategy began in July with plans for completing a draft model by the end of August. The model will inform T-TESS pilot implementation, future plans for a train-the-trainer T-TESS training model, a tentative Student Learning Objectives (SLO) pilot, and a second year of on-boarding additional districts to implement T-TESS in 2015–16. TEA’s two educator evaluation system partners, NIET and McREL, launched almost 60 statewide trainings for the 70+ volunteer pilot districts ready to implement the new systems. The training sessions provide participants with (1) a broad overview of each system’s purpose, (2) an understanding around the need for new, growth-focused teacher and principal evaluations, (3) a defined process for certified system appraisers to use during the pilot, and (4) guidance on areas within the process that identify where LEAs have discretion in determining local approaches that work based on the context of each individual district. TXCC, TEA, and ESC 13 staffs will offer further support to the pilot LEAs by bridging the summer trainings and the beginning of school year evaluation activities with a feedback structure. This structure will establish a communication’s process between the districts and TEA, allowing the agency to refine the system based on the hands-on, real-time experiences of the pilot volunteers. As planned, the Texas Education Agency (TEA) successfully transmitted its educator evaluation system waiver submission to the U.S. Department of Education on May 2. The submission included a description of the process the State used to inform revision of the current teacher evaluation system, the Professional Development and Appraisal System (PDAS). The submission also outlined key aspects of Texas’ new educator evaluation and support system, which includes multiple measures (i.e., rubric-based observations, a teacher directed goal-setting process, and measures of student growth) designed to improve teaching practices and knowledge, and support the professional learning and growth of Texas educators. Also in May, local teachers, TEA, TXCC, and Region 13 Education Service Center staffs participated in a preview of training on the new teacher observation rubric developed earlier in the year. This opportunity allowed the Agency to provide trainers with feedback on areas within the observation rubric and teacher evaluation process that need further refinement before rolling out the full training to pilot districts and regional service center staffs in June. In April, the Texas Education Agency (TEA) held two on-site meetings in collaboration with Education Service Center 13, the State’s educator observation tool vendors NIET (teacher tool), and McREL (principal tool). During the meetings, information was shared with the 70 LEAs that have volunteered to participate in the State’s pilot of the new teacher and principal evaluation systems. The Agency collected feedback from the attendees on how it can support the pilot sites during the pilot period (school year 2014–15) and discussed training plans and schedules for the initial training that will begin in June. TXCC staff with specialized expertise in teacher evaluation systems’ design, implementation, and value-added measures attended in preparation for future Agency needs around the inclusion of data on student growth as one of three components used to evaluate teacher and principal performance, promote the continual improvement of instruction, and guide professional development. TXCC also assisted the TEA in developing a document comparing the current teacher appraisal system, PDAS, with the new teacher evaluation and support system. TXCC also supported TEA’s outreach and communication efforts related to the new system by capturing and compiling videotaped testimonials from steering committee members regarding their work on crafting new teaching standards and a new observation rubric, and providing the State with input and feedback on composition of system components. In March, the Texas Education Agency convened its teacher evaluation steering committee for a fifth time to review a proposed teacher observation tool that will replace Texas’ existing teacher observation protocol, Professional Development and Appraisal System (PDAS). The development of this new observation rubric was informed by steering committee feedback collected at its February convening. Designed to evaluate teacher instruction and guide professional development, the proposed rubric spans four areas of teacher practice: (1) planning; (2) instruction; (3) learning environment; and (4) professional practices and responsibilities, and is grounded in the recently revised Texas teacher practice standards. In addition, as part of their work, the committee provided state leaders with recommendations on the structure of Texas’ new statewide teacher summative evaluation system. The committee recommended that the State consider a matrix approach in determining a summative rating that would weight a combined observation and professionalism component more heavily than the component based on measures of student growth. In November 2013, Texas Education Agency (TEA) issued a request for proposals for a vendor to assist the State to revise the Texas' teacher observation tool and to lead statewide training with districts that will pilot the tool. In February, TEA named the National Institute for Excellence in Teaching (NIET) as the awardee for this work, enlisting the Institute as a new partner in this effort. In mid-February, following collaboration among partnering entities, NIET and TEA shared a proposed teacher observation rubric at the fourth teacher evaluation steering committee meeting held February 27–28. Steering committee members worked in small and large groups to complete an alignment analysis on the proposed rubric, and provided input to state leaders on possible revisions to reflect quality-teaching practices aligned to the State's proposed teacher standards. Additionally, committee members discussed the advantages and disadvantages of two statewide teacher evaluation approaches––matrix and weighted—and provided feedback to TEA on a preferred method for incorporating multiple measures in the new teacher evaluation and support system. TEA staff will use this feedback to inform its policies and decision-making processes. The steering committee will convene for a fifth time at the end of March. January marked a transition point for Texas' educator evaluation and effectiveness initiatives. Following Phase I of the project—revising Texas' teacher practice standards—Phase II is now in its initial stage. It includes a review and revision of the Professional Development and Appraisal System (PDAS), Texas' existing teacher observation protocol. In addition to re-evaluating PDAS, the State will move toward defining and establishing a statewide educator evaluation and support system made up of multiple measures. To lead Phase II, TEA convened its educator effectiveness steering committee for a third time so it could advise the State on how it should update PDAS to (1) align with the State's revised teaching practice standards and (2) support and improve teaching practice, in order to raise student achievement. Texas' revised standards for teaching practice were released for public comment in the Texas Register on Friday, December 13, 2013. The standards, designed to improve the teaching practices of Texas educators and improve student learning and achievement, will be used to inform the development of a new statewide teacher appraisal system. In addition, the State's recent RFP for a teacher evaluation and support component of the system closed on Tuesday, December 3. A significant responsibility of the selected applicant (to be named in early January 2014) will be to align tools, resources, and training materials for the new component to the new teacher standards. During November, the TEA reviewed the national content center's teaching frameworks analysis, incorporated applicable recommendations, and continued to revise the new Texas teacher standards with a final review by the Office of Commissioner of Education. The new standards include six new domains for Texas teachers that address instructional planning and delivery, knowledge of students and student learning, content knowledge and expertise, learning environment, data-driven practice, and professional practices and responsibilities. These standards will be available for public comment in December through the Texas Register. The timely completion and delivery of project tasks have enabled TEA and TXCC staff to be thoughtful and deliberate in planning while also ensuring that project components are grounded in research and emerging promising practices. In October, the second draft of Texas' revised teacher practice standards was completed. This draft was shared with the Center on Great Teachers and Leaders to complete an analysis against the Interstate Teacher Assessment and Support Consortium (In TASC) and National Board for Professional Teaching Standards (NBPTS) teaching frameworks. The center will complete its analysis during November. In September, three additional committee members joined the steering committee tasked with revising Texas’ teacher standards. The additional members add expertise in teacher advocacy, education and school administration, and special education. The committee convened for its second meeting on September 27–28. The committee members began by providing feedback on the revised drafts standards for instruction, the first domain developed by the committee. Then, in small- and large-groups, members read research relevant to the four remaining domains identified in August (content, student learning, professionalism, and learning environment) and crafted approximately 20 standards across these domains that represent what teachers should know and be able to do well in the classroom. Two additional committee members joined the steering committee tasked with revising Texas' teacher standards. This brought the August on-site inaugural meeting to 100% participation with 21 members. Drawing on the body of research and information presented by the project's experts, the steering committee identified 14 areas of teacher practice, critical to effective teaching, that lead to student achievement. The committee collapsed these themes into five broad areas of teacher practice that impact teacher preparation, induction, mentoring, effectiveness, recruitment, and retention. One area, instruction, was selected by the committee to be the first domain and set of standards that would be drafted for the State of Texas. Working individually and in small-groups, members provided input and recommendations for what standards in this domain should look like if they represent what teachers should know and be able to do well in the classroom. The draft, Instructional Planning and Delivery, was submitted by the technical writers to TEA in mid-August and sent on to a national content center for review against four national teaching frameworks. June's call for steering committee member participation was successful, resulting in a group of 19 members. With the addition of two technical writers and Tim Regal from the Texas Education Agency the project team is now complete. A key resource developed during July will serve as a guidepost for the steering committee, national content center, and technical writers as they begin the work of revising Texas' educator practice standards. The resource, a guidelines/criteria/standards-structure document, establishes quality expectations for the standards' revisions and grounds these changes against Texas policy, law, and its academic standards. The TXCC continued its work with TEA as key action steps and responsibilities were defined for the Texas Standards for Teaching Practice project. TEA determined the process for revising its teacher standards, a critical component of the project's success and sustainability. Texas extended its collaboration efforts to include one of the national content centers, Great Teachers and Leaders, as a vested partner. This partnership will add significant value to the revision process and is expected to support the State's efforts to ensure that all revisions reflect coherence and alignment to high-quality teaching. Work began on selecting a team of external writers who will draft the new standards and facilitate much of revision work. Teacher effectiveness experts have been confirmed for the August steering committee meeting. These experts will provide steering committee members with research-based knowledge about effective teaching and teacher standards development. As a result, the goal for the standards' revisions is that they reflect a strong research base, are thoughtful, and represent key components of effective teaching. TXCC staff held several meetings and conference calls with Mark Baxter and Priscilla Flores from TEA's Division on Educator and Leadership Quality during May. 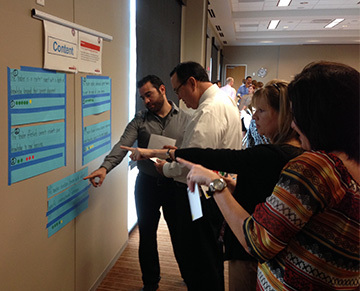 TXCC staff provided draft documents including a projected timeline of key milestones and deliverables over the next 18 months of the project; they also provided a description of key processes and approaches taken by others in developing or revising educator practice standards. 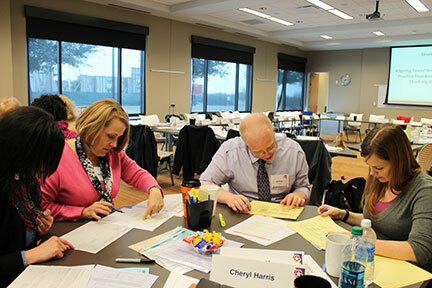 Staff members from TXCC and TEA collaborated to determine the composition of a steering committee that will inform the teacher practice standards revision—a key milestone for the work. A plan for convening the committee, including the method for reaching consensus, was confirmed. The inaugural meeting will occur in August 2013. Additionally, at TEA's request, TXCC staff attended a meeting of the Professional Development and Appraisal System (PDAS) Advisory Council, composed of PDAS trainers from the education service centers. The council provided recommendations to TEA for future PDAS revisions. TXCC leaders met with Mark Baxter and learned of some recent changes in staff roles and responsibilities within the Division of Educator Leadership and Quality. Mr. Baxter asked for feedback on a description of skills related to value-added modeling an individual employed by TEA would need to have to bring that work into the agency. Staff from SEDL's research and evaluation unit reviewed the list of tasks and related expertise and offered specific, written feedback relative to each component. TXCC leadership met with Mark Baxter and Mike Vriesenga to further discuss the teaching standards project, including potential partners in the work and expansion of the project's scope. A proposed timeline was presented and revised, and next steps were identified in preparation for a follow-up meeting in early April. TXCC leadership met with Mark Baxter, Senior Policy Advisor at TEA, to discuss a project involving revision of the state's teaching-practice standards that were developed in 1997. The scope of the project was discussed, including the identification of possible tasks and deliverables. 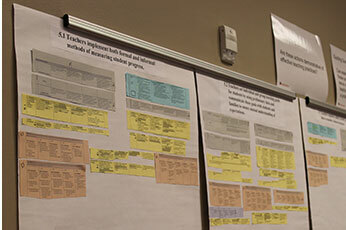 TXCC will provide a draft scope with associated timelines to Mr. Baxter for his review.